You know you are getting old and turning into your Mother when you find cleaning products exciting. Many of the mainstream cleaners found at the supermarket make me wheezy and I never have liked the thought of breathing in chemicals. I came across Mangle & Wringer via Twitter and got in touch with them regarding their products. Mangle & Wringer have a range of traditional, non-toxic cleaning remedies. Products are also unfragranced and not tested on animals. There is a delightful back story to the company which you can read over on the website. I have been lucky enough to put the entire range to the test - Spray & Go, Kitchen Cleanser, Laundry Powder, Good for Glass, Bathroom Balm and Natural Bleach. Each product has impressed me but there is one in particular which I can use to demonstrate the strength of these products. I gave the Kitchen Cleanser the ultimate test on my nasty kitchen sink. My sink should be a light grey colour but it always had a nasty tangerine brown stain thanks to previous tenants. No matter how hard I tried I have never been able to budge the discolouration, well that was until now. The Kitchen Cleanser is a paste, I scooped a little from the tin and then rubbed onto the sink using one of those cheap non stick washing up sponges. I worked at the sink for 5-10 minutes, reapplying product and rinsing in between. I started to notice a vast improvement in the colour almost immediately. The stain had faded and in some areas I have almost restored the original colour. What I like about the Mangle and Wringer Kitchen cleanser is it rinses away easily without leaving a noticeable chalkiness from dried paste. At the suggestion of Mangle & Wringer, I later filled the sink with hot water, added a scoop of natural bleach and left it for a few hours. Since taking the pictures below, I think my sink is looking even better with continued cleaning. I don't think it will ever be restored completely but it certainly makes me happy to see it look less disgusting. Just for guidance, the consistency of the Bathroom Balm is slightly different. It has a mousse like texture but it worked equally as well on soap scum. The Spray & Go is a multi purpose product which I make sure is on hand for quick clean ups on surfaces around my home. The only minor downside is lack of fragrance. Prior to trying this spray, my cleaner of choice is Greenscents in mint and I have missed the fresh scent. In my bedroom I have mirrored wardrobe doors and the glass cleaner made light work of finger prints. I found the task quick and easy without too much smearing. I have never used a bleach powder before now so I can't compare to anything else but I have been using it in the washing machine to brighten up My Sugarpuffish's white shirts. I highly recommend Mangle & Wringer for eco-friendly household cleaning. I am not sure I would replace every product when they run out (e.g laundry powder & bleach) but I certainly wouldn't want to be without the kitchen cleanser. Such nice packaging for cleaning products! I thought it was skincare at first haha! 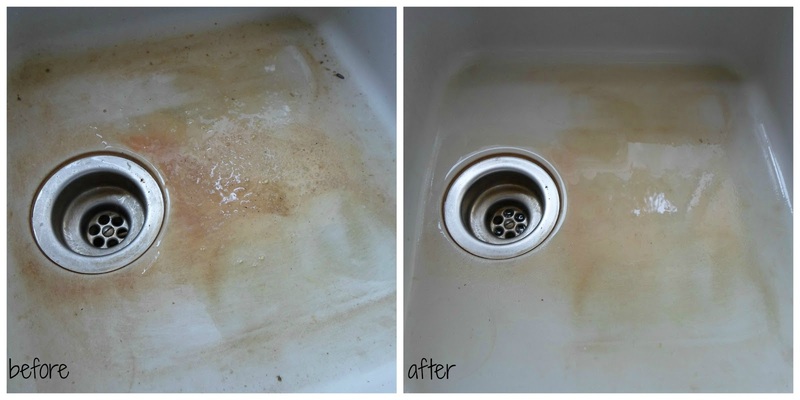 The difference is amazing on your sink!